Taking pictures in the Middle East can be a challenge. The sand and heat are just a couple of the things you’ll probably worry about. Even without a sandstorm, the sand seems to get everywhere and into everything. Left unchecked, it will eventually cause problems with your camera gear. And even without film to worry about, the heat will take its toll on you and your equipment. Here are a some things to consider and some tips to make your picture-taking more enjoyable. It gets everywhere and it can’t be avoided. The best thing to do to avoid getting it into all those inaccessible places in your camera is to keep your camera in a zipped bag, pouch or pocket when you’re not using it. Avoid using your camera in sandstorms or windy conditions. If you can’t keep the sand off your gear, be sure to bring a squeeze bulb blower to help remove the sand and dust. Canned compressed air works well, but it tends to be bulky, heavy and forbidden in your carry-on. Be sure to thoroughly remove any sand or dust from both your camera and your bags and cases before changing lens, batteries or memory cards. Wraparound sunglasses will keep the sand out of your eyes. I don’t recommend wearing contact lenses in the desert because the chance of getting dust in your eyes is almost guaranteed. 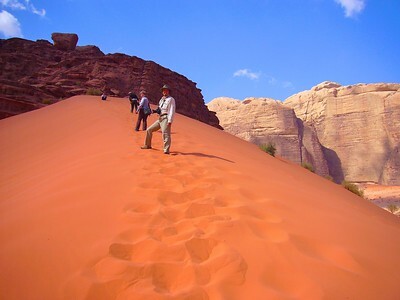 High-top shoes or boots will help keep out the sand as you’re walking around shifting dunes. Back in the days of film, outside of x-rays, heat was your worst enemy. Nowadays, we don’t worry so much about film, but the heat can still wreak havoc on you and your equipment. Begin by avoiding the sun altogether. Don’t go out during the midday between 10 a.m. and 2 p.m. Shoot around dawn, dusk or at night. Not only is it cooler, but the light is often better. Black bodies and lenses absorb the entire spectrum of light, including infrared. If your camera overheats, it might simply shut down until it cools off. In the worst case, it could damage the electronics. Keep your camera in a bag shielded from the sun wherever possible. Modern lenses are built to take some temperature extremes, but you should avoid exposing it more than necessary. Keep a lens hood on and use you lens cap whenever possible to avoid having the sun shine into your lens. Just like a magnifying glass, it can concentrate the light and damage the shutter or the mounts holding the glass elements. Keep yourself cool to avoid overheating. Bring plenty of water. Use sunscreen. Wear light colored, loose fitting clothing but be sure to pack a jacket. The temperature can drop quite a few degrees in the desert when the sun goes down. A light-colored hat can keep the sun off your head and face. If you’re feeling adventurous, dress like the locals. 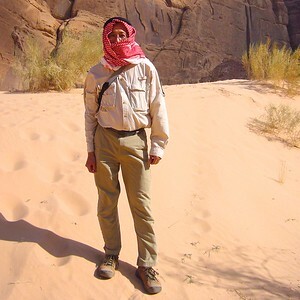 A keffiyeh is a traditional Arab headdress that not only protects against sun exposure, but also shields your mouth and eyes from sand and dust. I felt very safe in the Middle East. I never felt threatened or at risk just because I had several thousand dollars worth of gear dangling from my neck. Nonetheless, you should be aware of your surroundings and don’t make yourself an easy target. Don’t advertise. Keep cameras in a bag when not in use. Don’t leave your gear sitting where it could be easily snatched. Put the strap of your camera bag around your chair when you’re sitting in cafes or restaurants. Don’t leave your gear in plain sight in your hotel room when you’re not there. Use the room safe if available. 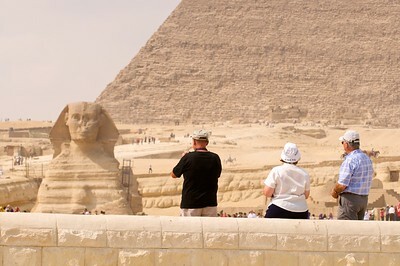 Avoid asking strangers to take a picture of you; ask someone in your tour group instead. Many countries don’t have the same freedoms we take for granted here in the U.S. 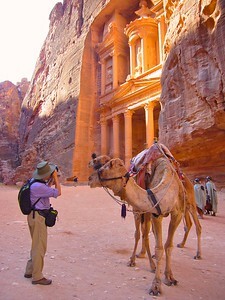 In some countries, photographers are viewed with some suspicion, especially if you have professional looking equipment. When in doubt about whether to take a photo or not, it might be best to ask. In the Middle East, transportation centers such as airports, railway stations, ports and even subways are sometimes controlled by the military, and taking pictures of those facilities could be prohibited. Ask before bringing that camera up to your eye, or risk having it confiscated. It goes without saying that military bases, military vehicles and military personnel are strictly off-limits. Some tourist sights even forbid photography, usually flash photography, but lately any photos at all. Unless, you think you can take a photo very discreetly, without flash or even lifting the camera to your eye, don’t even try. Before you take a photo of that colorful local, it might be prudent to first ask for permission. Some people in the Middle East may not want their photo taken and you should respect their wishes. Be especially careful of women wearing a niqāb (head and face covering veil) or any other head covering. Although most are open to photographs, in some cultures, it may be a social faux pas to speak to an unmarried, unescorted woman, much less take her photo. You wouldn’t want to find out that you have to marry that person just because you took their photo.